The Duke and Duchess of Sussex during the Commonwealth as they attend the Your Commonwealth Youth Challenge reception at Marlborough House in London. THE DUKE AND Duchess of Sussex will meet Taoiseach Leo Varadkar today, as well as taking in a visit to Glencairn House – the official residence of the British Ambassador to Ireland. Prince Harry and Meghan Markle are also due to visit some of Dublin’s hotspots during their two-day trip to Ireland. The newly-weds will attend Government Buildings this afternoon to meet the Taoiseach, and then attend a garden party reception in the British ambassador’s home. On Wednesday, the pair have a packed schedule of events. Their itinerary includes a visit to meet President Michael D Higgins at Áras an Uachtaráin, followed by a walk around Trinity College where they will stop by the Book of Kells. The couple will then visit the Famine memorial and EPIC- the Irish Emigration Museum at the CHQ building. 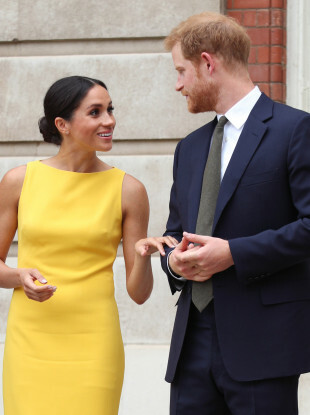 It is understood that Markle will have a detailed family tree of her Irish ancestry information presented to her during her visit to the museum. A tour will also take place at Croke Park tomorrow. The last time Markle travelled to Ireland in 2013, the actress visited the Guinness Storehouse where she learned to pour a pint of Guinness in front of the press. The royal visit follows on from Prince Charles and his wife, Camilla, Duchess of Cornwall’s trip to Cork and Kerry last month. Email “Prince Harry and Meghan Markle to meet Leo Varadkar and Michael D Higgins during two-day visit to Ireland”. Feedback on “Prince Harry and Meghan Markle to meet Leo Varadkar and Michael D Higgins during two-day visit to Ireland”.